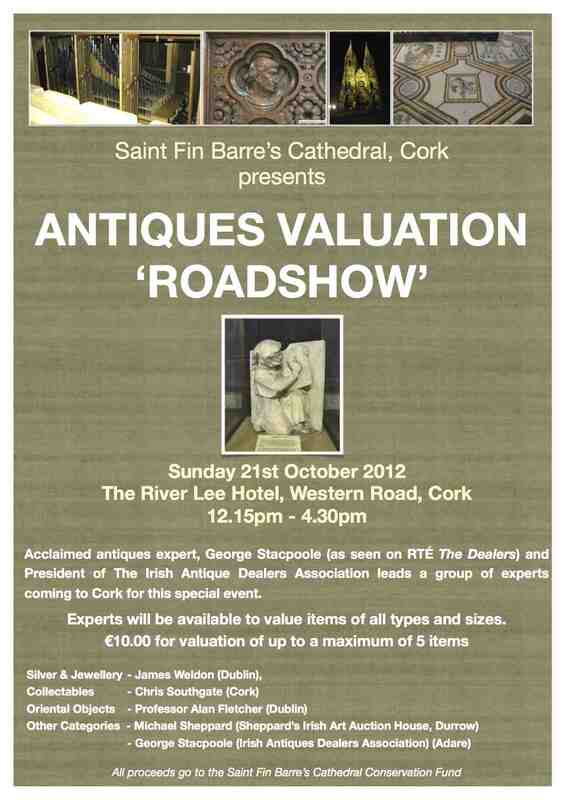 Acclaimed antiques expert, George Stacpoole (as seen on RTÉ The Dealers) and President of The Irish Antique Dealers Association leads a group of experts coming to Cork on Sunday 21st October as part of St Fin Barre’s Cathedral Conservation Project Fundraising Drive. The Antiques Roadshow will run from 12.15 pm to 4.30 pm in the River Lee Hotel, Western Road, Cork with Mr Stacpoole and other experts shedding some light on people’s most treasured and unusual possessions. Experts, including Dublin based James Weldon (silver and jewellery), Chris Southgate (collectables), Professor Alan Fletcher (oriental objects) and Michael Sheppard of Sheppard’s Irish Art Auction House will be available to value items of all types and sizes. The fee is €10.00 for a valuation up to a maximum of 5 items. All proceeds go to the St Fin Barre’s Cathedral Conservation Fund which is currently focussed on rebuilding the organ. Parking and refreshments are available on site.